Scientists at Arizona State University have created a new kind of solid state memory that they say is much cheaper and more efficient than flash. And crucially, because it uses a new kind of nanotechnology, storage capacities will be much higher than anything we have today, for a tenth of the cost. The new memory is called programmable metallization cell (PMC) and one terabyte (1TB) USB thumbdrives are said to be just a few years away. 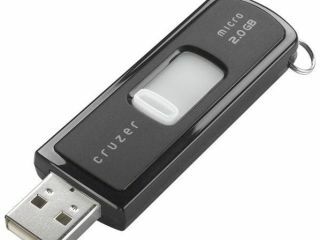 The largest commercially available flash drives today are only 32GB in size - 30 times smaller and very pricey. The new memory uses nano tech to charge copper particles on the molecular scale, making it 1,000 times more energy efficient as current flash memory. This bodes well for use in portable devices like phones and iPods. "A thumb drive using our memory could store a terabyte of information," Michael Kozicki, director of ASU's Center for Applied Nanoionics, told Wired magazine. "All the current limitations in portable electronic storage could go away. You could record video of every event in your life and store it." For the last eight years, the density of flash memory has doubled anually, meaning that capacities have increased 100 per cent every twelve months. But now flash memory is reaching its physical limitations, so this new memory could be stepping in at the crucial time. The new memory could also be the answer for computer manufacturers who want to incorporate solid state hard drives but can't due to limitations of size and cost. Wired says that PMC memory works in a vastly different way to current flash technology. Flash uses electronic charges to physically store bits of information, whereas PMC works on the molecular scale to create nanowires from copper atoms. These nanowires record binary ones and zeroes, enabling a massive amount of data to be stored in a tiny space. If a positive charge is passed through the PMC memory, the nanowires disassemble, allowing it to be used over and over again. The first PMC memory chip is slated to go into production in April 2009.